There is something go refreshing and amazing about foods that have that lemon tang to it. Citrus has always been one of my first loves…especially lemon. Lemonade, lemon chiffon, lemon meringue, lemon zest, lemon…lemon…lemon! Give me all the lemon. Luckily, my friends know of this lemon love…and often share it. That goes double for my friend Jenn, who kindly stocked me up with a package of WOW Baking Company’s Lemon Burst Cookies. I mean…what is not to love about that? LEMON. BURST. COOKIES. I was thrilled to have these in my pantry…and after working through some other items…pulled these out one evening for a delicious palate cleanser after dinner. Dessert doesn’t have to be big…but it should always be enjoyed. I love a small touch of sweetness after a meal. My desserts at home are often just a couple bites of something, but I never deny myself that little treat. That being said…I pulled open this little sack of cookie goodness and discovered a bag full of amazing soft, two to three bite cookies. I checked the label for the serving size…which says…2 ounces. That turned out to be around 4-5 of the little mini cookies. So…I dished up a measured serving (yes…I weighed them each time!) for my roommate and one for me. I delivered the cookies to her and she dug in. She might love lemon even more than I do…so she was happily nomming away at her batch of cookies when I finally settled in with my dessert. One bite confirmed what her appreciative chewing noises were telling me. These…WERE AWESOME!! The texture was somewhere in between a butter cookie and a cake. Seriously. They were so soft and light…I loved it. No annoying crunching. Flavor-wise, it was like eating a bit of sugar cookie dough that was kicked up with a hint of lemon flavor. Just enough to sweeten and not overpower. It was so refreshing. Each bite was a treat, most definitely. WOW Baking Company is very dedicated to producing soft, chewy, delicious tatsting baked goods that are wheat-free and gluten-free. According to their Website, all products are produced in small batches with premium, all-natural ingredients. You won’t ever find hydrogenated oils, refined sugars, artificial flavors or wheat and gluten in any of the products they produce. Their products are non-GMO, which is always nice. WOW Baking Company produces all their products in a dedicated and certified gluten-free facility. So, let’s discuss the ingredients in WOW Baking Company Lemon Burst Cookies, shall we? These cookies are made from a gluten-free flour blend (brown rice, sweet rice, tapioca), cane sugar, butter, eggs, corn starch, potato starch, vanilla, cream of tartar, pure lemon oil, xanthan gum, baking soda, salt and citric acid. That’s it. And what you get is a product you’d be hard pressed to guess was gluten-free if you didn’t know. Trust me. Nutritionally speaking, a serving of WOW Baking Company Lemon Burst Cookies is, as I mentioned before, 2 ounces, or around 4-5 cookies. This serving will dish you up 260 calories and 12 grams of fat. These cookies also have 50 mg cholesterol, 220 mg sodium, and 14 grams of sugar. 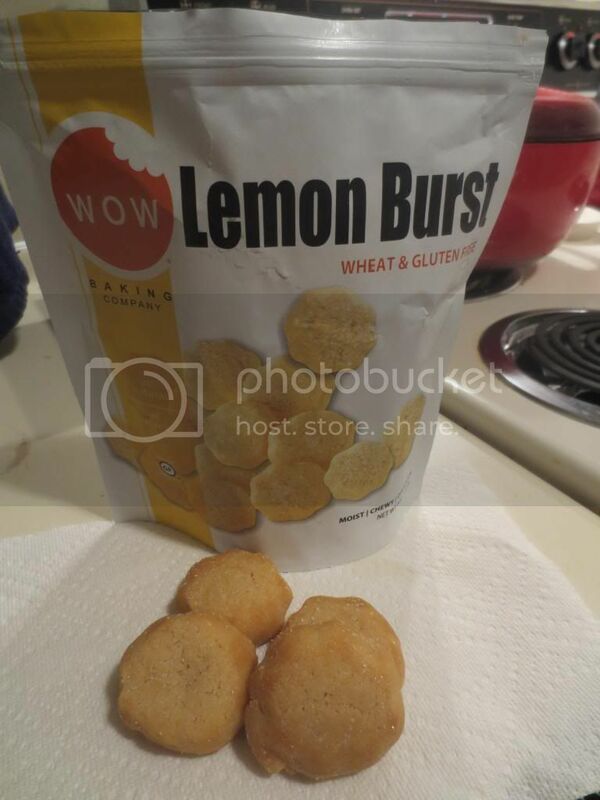 The Lemon Burst Cookies also have 1 gram of fiber and 2 grams of protein in each serving. So…they are a treat for sure. Don’t over indulge…but do enjoy. I fell in love with the WOW Baking Company Lemon Burst Cookies at first bite. Chewy, soft, light, and delicious. The right amount of lemon flavor. The right balance of everything else. Real ingredients means really delicious treats. This…is a favorite for sure! This entry was posted in Baked Goods, Cookies, Dessert, Food, Fruit, Gluten-Free, Products, Review, Snacks, Sweet Stuff by The Celiathlete. Bookmark the permalink. THANK YOU for this information. I didn’t know! !